Traditional Chinese medicine has developed over a period of at least 3,000 years. The earliest verifiable record of Chinese veterinary medicine dates from the Shang Dynasty (1766-1066 BCE), when documents reveal that veterinary doctors were concerned with horses. The Chinese regularly practiced acupuncture on horses, as evidenced by Dr. Bo Le's canon of veterinary acupuncture, which was written between 659 and 621 BCE. The technique was subsequently applied to other farm animals, and eventually to dogs, cats, and birds. In 480 BCE, Shun Yang, considered to be the father of veterinary Chinese medicine, became the first full-time practitioner in the field. 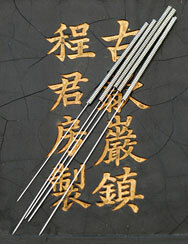 During the sixth century A.D., acupuncture was introduced into Japan, where it was used in equine medicine; the Jesuits introduced acupuncture into France in the seventeenth century. Acupuncture was studied in both human and veterinary medicine in Europe, but fell into disfavor during the late nineteenth century. During the same period, Western medicine became popular in China, and acupuncture survived only in the countryside and other remote areas. Because Western medicine was not accessible during World War Two, the Chinese were forced once again to rely on their traditional medicine. When the government was restructured after the war, it issued mandates to pursue traditional Chinese medicine, and to integrate Western modalities with TCM in schools of medicine. In 1947, a school of agriculture and veterinary medicine was opened and was devoted to Veterinary Traditional Chinese Medicine. In recent years, there has been a growing interest in the field of holistic medicine as a complement to traditional Western veterinary medicine. As people around the world are turning to more natural methods of improving their health, they look for similar modalities for the companion animals who share their lives. Today, Traditional Chinese Veterinary Medicine (TCVM) is growing in practice in veterinary clinics around the world. Traditional Chinese Veterinary Medicine (TCVM) focuses on health maintenance, illness prevention and non-invasive treatment through the modalities of acupuncture, herbal medicine, nutritional (food) therapy (additional factors may include the quality of the patient's food, water and air). In addition, TCVM practitioners consider all aspects of the patient's environment, approaching disease as an imbalance in the body. They recognize the animal is an integrated, energetic structure, and that disease is caused by a disruption in this balance. In TCVM, rather than labeling each symptom as a separate problem, practitioners identify patterns of disharmony. The primary goal of TCVM is to restore the energy balance in the patient. Treatment encompasses a dual emphasis on balance within the body, and on balance between the body and the environment. TCVM practitioners approach treatment with a recognition of the inherent uniqueness and individuality of each patient. In TCVM, each animal receives an individually tailored treatment protocol. Treatment stimulates the animal's natural healing functions, and restores flow, balance and the regulation of chi (energy). In so doing, treatments often quickly and directly address the condition of the specific animal, rather than a generic symptom of the disease or ailment.